At CRD we have extensive experience of modelling, designing and manufacturing equipment for Batch Chemistry applications, supplying solutions to diverse customers such as Dow, Shell and Avantium Technologies. We can supply unique off-the-shelf products from our Bullfrog range of batch reactors, or customised solutions in single reactor and high-throughput, multiple reactor formats. 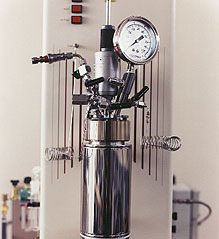 The batch reactor design can be tailored to your requirements, with options for materials of construction, dosing, mixing technology, high pressures, extreme temperatures and computer control. All our batch reactors are simple to use, have a compact footprint and represent excellent value for money. And, of course, our reactors are always fully safety tested and can be certified to meet all relevant legislation. Whether you want to do solvent screening or catalyst evaluation, hydrogenations or polymerisations, dissolution or crystallisation you�ll be able to select a configuration that suits you. Find out more about the range by visiting our Bullfrog Batch Reactor page and looking at the information on Single and Multiple reactors in our related links. The team at CRD has 20 years of experience developing a vast number of automation, batch and flow reactor systems. By treating their customers as partners, the CRD engineers acquire an intimate understanding of the physical, chemical, and thermodynamic challenges that need to be addressed for a proposed reaction automation, so ensuring a successful outcome.